Now the summer break's long gone, opportunity knocks for experiencing some more 1st time visits to football grounds. 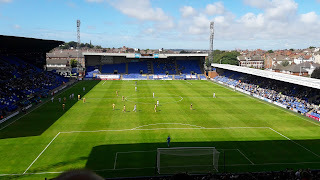 And with the season only a couple of weeks old, my very own stag weekend meant that a trip to Prenton Park would herald an early 'football away day', to witness Tranmere Rovers vs Sutton United. You may ask why my friends and I had ended up opting for an afternoon of action from the Vanarama National League, and that would be a fair question! Following a morning of paintball, which ended with the remaining pellets being used up on the stag and best man (ouch! ), we had about 45 minutes to get from Liverpool city centre to Birkenhead. This turned out to be ample enough time, although the long tunnel underneath the River Mersey made it difficult to get our bearings, and the bus route left us momentarily concerned that we had made a catastrophic navigational error. In the end, we reached the edge of Prenton Park with about 15 minutes to go until kick-off, where stewards directed us towards the turnstiles below the (Bebington) Kop stand. The cost of a ticket was £19, which did seem a little steep for a non-league fixture, and getting hold of a matchday programme was more difficult than I've ever previously experienced. After chatting with a couple of stewards, before the game and at half-time, the suggestion was to wait until the end of the match and to visit the club shop. There I did find a box of programmes on the counter, so whilst it was nice to eventually get my customary souvenir, knowing who was on the pitch during the 90 minutes was guesswork. Prenton Park, in its current site, has been the home of Tranmere Rovers since 1912, but it still feels like a natural, purpose-built location. A main road borders the Johnny King stand and the Cowshed (where the away fans reside), whereas the Main Stand and Kop back on to an extensive car park area. For the game itself, we were sat in the higher section of the Kop, which provides a steep view of the pitch and a pretty decent atmosphere, especially when considering the rung of the football pyramid Tranmere are in. The area behind the goal was the most vocal and where the majority of chants started, and they were ably-abetted by a fan who spent the whole game banging away consistently on a loud drum. 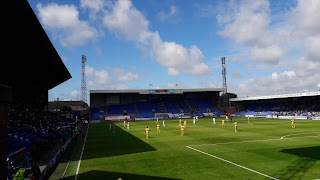 Tranmere Rovers started off in confident fashion, and passed the ball around well enough, living up to the fact that they should be one of the promotion favourites for the National League this season. During the 1st half they threatened sporadically, but too often their build-up play was undermined by the lack of a clinical edge up front. Still, in the opening 15 minutes, both sides came close to scoring. First, a defensive header from a corner dropped to Tranmere's Ollie Norburn on the edge of the area, who hit a great volley just over the top left corner. And shortly after, Sutton Utd striker, Tommy Wright, struck a decent shot from 25 yards which required the goalkeeper to tip it over the crossbar. Both teams wasted further opportunities during the first half an hour. With the Sutton United goalkeeper stranded, Jay Harris had a tame effort cleared off the line, whilst Ross Lafayette spooned a shot over from just 8 yards for the away side. Ritchie Sutton and Andy Cook then wasted headers to give Tranmere the lead, before Sutton capitalised in the 32nd minute. Craig Eastmond got hold of the ball in midfield, and his pass forward split the Tranmere Rovers defence and found Craig Dundas, who raced ahead and dinked a simple finish past Scott Davies. At half-time, our party were in need of refreshment! Some of us managed to get what they wanted, but for the rest, it was a case of wondering what might have been. I loved the sound of a chicken balti pie, but once I reached the counter, all that was left was the unpopular cheese and onion variety, so a dry burger had to do. Other sold-out near-misses included potato wedges and hot dogs, so needless to say the 2nd half saw a few people flagging. Meanwhile, Tranmere started the 2nd half with a flourish, a set-piece presented an early chance to equalise and this time Andy Cook hit the crossbar with a header. Sadly, for the home fans, this was as close as the 'Super White Army' would get to evening the scoreline. As the game wore on, Tranmere looked increasingly frustrated and unable to create any clear openings against the Sutton Utd defence. The final 15 minutes saw two notable events, firstly, the increasingly irritating diving of Ross Lafayette, who should have received a yellow card. And then, with a few minutes to go, Jay McEveley almost scored an own goal to double Sutton Utd's lead, his defensive nod rolling towards the base of the post. As the final whistle went, McEveley pulled his shirt up over his head, the no. 6 knew that he hadn't had a good game, but then it wouldn't have mattered if Tranmere had been more decisive when it was 0-0. Following the match, we gravitated past the statue of John King and back towards the Prenton Park Hotel, a perfectly fine local pub situated behind the away end of the ground. The pints there were pleasantly cheap, and we got to continue our afternoon of football, with Brighton vs Manchester City on the TV screen.